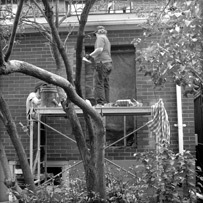 Tuck Pointing, Brick and Chimney Repair Toronto | Turnbull Masonry Ltd > Blog > Blog > How Does Age Of Brickwork Impact Its Stability? The age of your Toronto brickwork will impact a number of things, including its overall strength, necessary repair processes and how to best care for it. Brickwork can last centuries given the proper care, maintenance and repairs, which starts with understanding the unique makeup of your brickwork. The best techniques for maintenance and repairs are dependent on the year your bricks were originally pieced together with mortar. For one, mortar mixtures and application processes have shifted over the years. Some of these changes are for the better, but not all of them. Knowing when to apply age-old techniques and when to turn to newer methods of brickwork restoration is key, which is why it’s highly recommended to hire a trusted and experienced mason professional. The number one name for Toronto brick repair is Turnbull Masonry. The age of your brickwork will also influence how it was constructed in the first place. Historical brickwork was manufactured and applied differently from newer brickwork. In recent years, a large demand for mortar mixtures has created a darker mortar that is more uniform in appearance. Historic mortar follows no rules when it comes to color, shade or texture, and could be made from many combinations. A professional mason is able to test mortar to determine its composition. Therefore, failing mortar can be repointed with an appropriate match. Masonry mortar has been made stronger in more recent years, and while that sounds great it doesn’t fare well for older structures when applied as replacement mortar. If the old mortar is not as strong as the new repointed mortar, it will place excess pressure on surrounding brickwork. This will eventually cause bricks to crack or spall out of the wall completely. There have also been changes in the actual techniques used to apply brickwork. Finding a mason professional with enough experience and skill to understand the techniques of the past as well as present-day techniques is adamant for successful repairs on buildings of all ages. The older brickwork the more chance it has to be exposed to floods, earthquakes, and other natural and man-made disasters that impact its overall stability. Toronto weather is extreme, ranging from snowy and cold to hot and dry, plus floods are not uncommon either. As a result, Toronto brickwork is exposed to a wide range of potentially damaging forces. Having your brickwork regularly inspected, cleaned and repaired as needed ensures it continues to remain strong. If you ignore the necessary maintenance and repairs, brickwork will eventually fail. When it snows salt and deicers are placed on the ground, which can damage brickwork. Since deicers are popularly used during Toronto winters, this is something to keep in mind. Salt and deicers create a white stain known as efflorescence. Usually, this is fairly harmless and can be cleaned off using proper techniques. Efflorescence is far more common in certain types of brickwork, including older bricks. Newer clay bricks are often manufactured with balanced chemical additives to help reduce the possibility for efflorescence to develop. Older bricks were not manufactured in this way, increasing their risk for developing the issue. When creating a new brick wall the best ways to reduce the risk for efflorescence is to use low alkali cements, clean sands and clean water with no salt. The age of brickwork may dictate the best cleaning methods to utilize. With all brickwork, it’s important to sample the cleaning agent on one small area before applying to the entire surface. Depending on the actual makeup of mortar and bricks, different cleaning methods can strip the brickwork of its natural color as well as the top protectant layer that helps keep moisture out. Testing a small area ensures you don’t ruin your entire surface in one cleaning. Gentle cleaning methods include low-pressure water treatments, and using natural bristle brushes for scrubbing. That being said, abrasive brick cleaning techniques should be avoided in regards to newer brickwork as well. Rough chemicals or power washing could cause potentially irreversible damage regardless of brick age. This is why it’s highly recommended to hire a professional mason to clean all brickwork. Historic brickwork is ultra sensitive. In most cases, painting or dramatically altering historic brickwork is advised against, as this can damage the structure’s stability and devalue the natural history.